Lotus Evangelist: Microsoft steals the Lotus Background for Outlook 2010? Microsoft steals the Lotus Background for Outlook 2010? 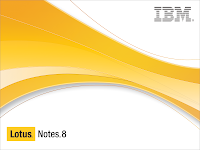 Seems to me that this looks very familiar if you have seen Lotus Notes R8. tell me what you think? Close enough to me to wonder if this means anything at all. Look at the second picture on their site which shows the client and tell me who is playing catch up? Doesn't everyone like Candy Corn? What's wrong with orange, yellow and white? Bright yes, but definitely swiped from the same stock graphics. For Bruce I will post some new information when I get a chance. um, small detail, but very disconcerting to have the OK and Cancel buttons reversed. Don't we have standards for these things??? but, per usual, when Outlook 2010 comes out everyone will be saying how cool the swoosh is like they invented it. One day I wrote the letter and in my home there was a power failure.And in this situation I didn't know what to do.My neighbour advised me-how to fix .pst file outlook.It is free as he said and tool helped me.Besides that utility fix outlook pst under and compatible with Windows 98,4.0,Me,2000,XP,Vista.